Our new display of work which includes early 1960s work of Anthony Day. alongside David Thomas Smith, and Martin Hardie's 1922 depiction of Sizewell and Joan Warbuton's Garden under Snow, is now open. Day was born in Wicken, Cambridgeshire in 1922, the son of a farmer. He turned to painting out of doors as his way of spending time in the countryside writing 'Farming became inseparable from my love of landscape and I returned to farm its beauty'. We have a group of large gouaches (H: 85 x W:119 cms framed) that depict the vastness of the local East Anglian local fenland landscape, capturing the weathered landscape in cool greys and browns to convey the light of a cold winter's day. Anthony Day (1922-). Winter at Denver, 1963. Gouache on paper. Anthony Day (1922-). Autumn Washland, 1960-1. Gouache on paper. David Thomas Smith RE (1920-1999). Southwold Harbour, 1974. Oil on canvas. Joan Warburton (1920-1996). 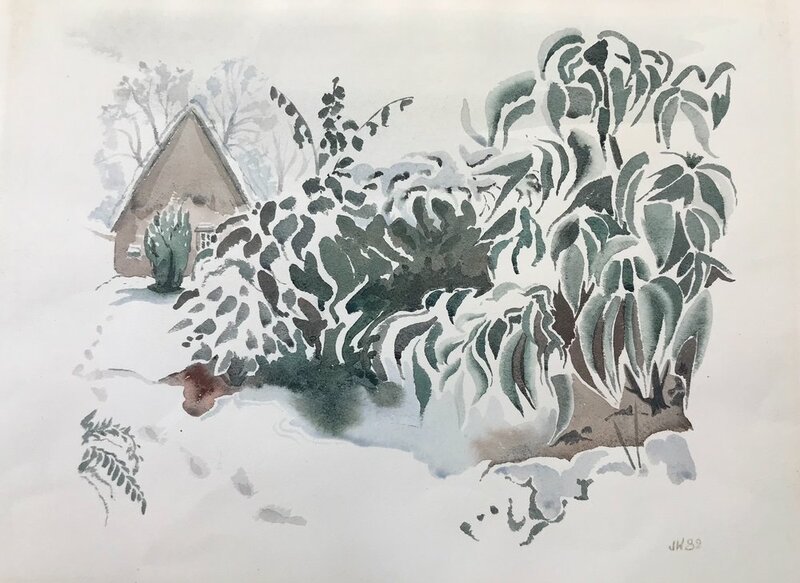 Garden under Snow, 1982. Watercolour on paper. Warburton attended finishing school in Belgium and studied under the painter Oswald Poreau and it was at this point she decided she wanted to be a serious painter. She returned to England and from 1937-40 studied at the East Anglian School of Painting and Drawing (Benton End) at Dedham under the tutelage of Cedric Morris and Arthur Lett-Haines. Warburton, like Cedric Morris, loved plants and gardens, and this is captured in this delicate watercolour.